Full extension slides are rated for 100 pounds when fully extended. Chrome finished wire basket provides sturdy support for your cookware. Includes hardware to install in your cabinet. 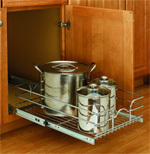 These two tier wire basket pull out shelves take care of your base cabinet storage needs. 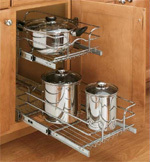 Heavy duty chrome wire baskets support your heaviest pots and pans. Full extension ball bearing slides rated for 100 pounds when fully extended.Unit is 19" tall and requires a minimum 19 1/4" opening height. Shelf height is fixed.